The flightless birds of Bird Island lead a mostly happy existence, except for Red (Jason Sudeikis), who just can't get past the daily annoyances of life. His temperament leads him to anger management class, where he meets fellow misfits Chuck (Josh Gad) and Bomb (Danny McBride). 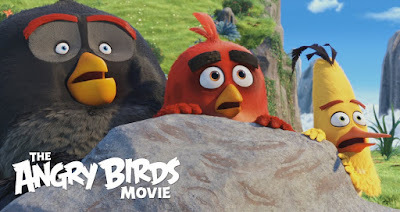 Red becomes even more agitated when his feathered brethren welcome green pigs and their leader, Leonard (Bill Hader), to their island paradise. In an attempt to convince the birds that the pigs are up to no good, Red, Chuck and Bomb head up the mountain to find Mighty Eagle (Peter Dinklage). But while out of the town the Pigs take off with all the eggs. Now it's up to Red, Chuck and Bomb to lead the birds in a fight for their eggs. The Angry Birds Movie is one of those rare games that really doesn't have a set storyline other than birds attack pigs because they stole their eggs. This in turn gives the movie free range on what to do with their characters and, at the same time, causes no outcry from fans because the story was the same as the game. This is why Angry Birds works, its an origin story for a game that has been around since 2009. Even if you never played the game or know nothing about it, you are still on the same page as everyone else. The only upside to playing the game before seeing the movie is the little nods to different levels and character's special abilities. The entire cast delivers with high marks going to Danny McBride, Gosh Gadd, Bill Hader, Jason Sudeikis and to Keegan-Michael Key as Judge Peckinpah, a Owl who stands on another bird's shoulders to appear taller and is the town judge. If you enjoy jokes that you'll get but not the kids, nods to X-Men: Days of Future Past and The Shinning; then this is one you don't want to miss. The kids will have a blast and you will too.